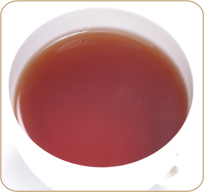 TEA BENEFIT Increased Energy: In moderation caffeine can be a benefit - in black tea it stimulates the metabolism, increases brain function and aids alertness. The caffeine in tea acts as more of a subtle stimulant, taking more than a few minutes to take effect, rather than hitting your system as quickly as coffee or cola. This effect is assisted by another compound found only in tea, theophylline. While caffeine chiefly targets the brain and muscles, theophylline stimulates the respiratory system, heart and kidneys. This helps maintain a healthy cardiovascular system. DESCRIPTION Nilgiri Leaf tea flavored with peach.